Over the last two editions we have highlighted what separates a custom soft contact lens from an “off the rack” or more “commodity” soft contact lens and stressed the importance of careful evaluation of the horizontal visible iris diameter (HVID) and its role in the selection of an overall diameter for the contact lens. Once the HVID is determined, we add 2.0mm to the HVID to determine our overall lens diameter for a spherical lens (eg. HVID = 12.0mm, overall lens diameter = 14.0mm). For a toric contact lens we add 2.5mm (eg. 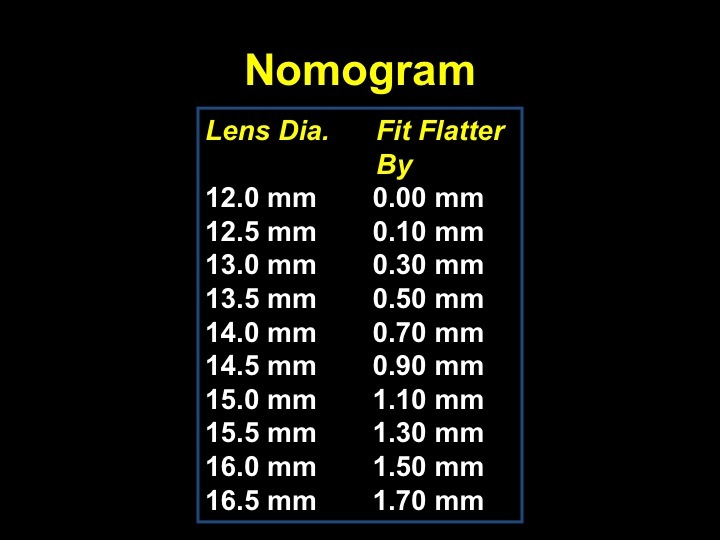 HVID = 12.0mm, overall lens diameter = 14.5mm) to provide adequate limbal coverage and to aid in lens stabilization. In addition to the overall diameter, the base curve is the other essential parameter that defines the sagittal depth of a contact lens. In determining our starting base curve for a custom soft contact lens, we utilize the patient’s central radius of curvature and the contact lens diameter that we determined from the patient’s HVID. A long established nomogram that we call the “fit factor” assists us in this process(see figure 1). The starting base curve of the contact lens is determined by a simple three-step process. Determine the patient’s mean keratometric reading by taking the average of the flattest keratometry and the steepest keratometry values: (flat K + steep K)/2. Determine the “effective K,” which is a number that embodies both the central keratometric readings and the HVID. This is done be adding 1D to the mean K for every 0.2mm that the HVID is larger than 11.8mm (this was the average HVID discussed in the last issue of Soft Special Edition) and subtracting 1D from the mean K for every 0.2mm that the HVID is smaller than 11.8mm. Determine the final base curve by referencing the nomogram (below) by converting the effective K into millimeters (from Diopters) and adding the fit factor. In this example, the patient’s keratometric readings are 41.25 @ 119 / 40.50 @ 029, therefore the mean K is 40.87. Since this patient has an extremely large HVID, we determine the effective K by adding 9D to the mean K: (13.6 -11.8 = 1.8, 1.8 divided by 0.2 = 9). The patient’s effective K of 49.87D converts to 6.77mm (see figure 2, below). 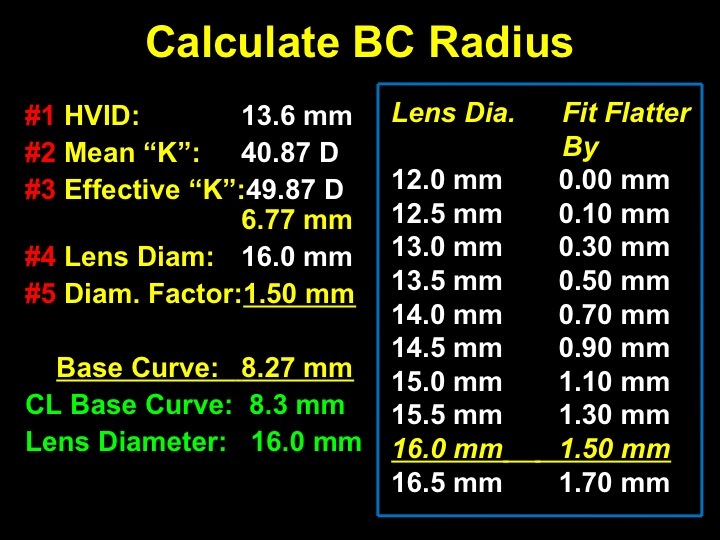 Since the patient’s prescription calls for a toric design, we are going to add approximately 2.5mm to the HVID of 13.6mm to determine our lens diameter. In this case, we decided to use an overall contact lens diameter of 16.0mm. The fit factor for a 16.0mm contact lens is 1.50mm. We simply add the 1.50mm to the effective K value of 6.77mm for a total of 8.27mm. We rounded that off to 8.3mm for our starting base curve. 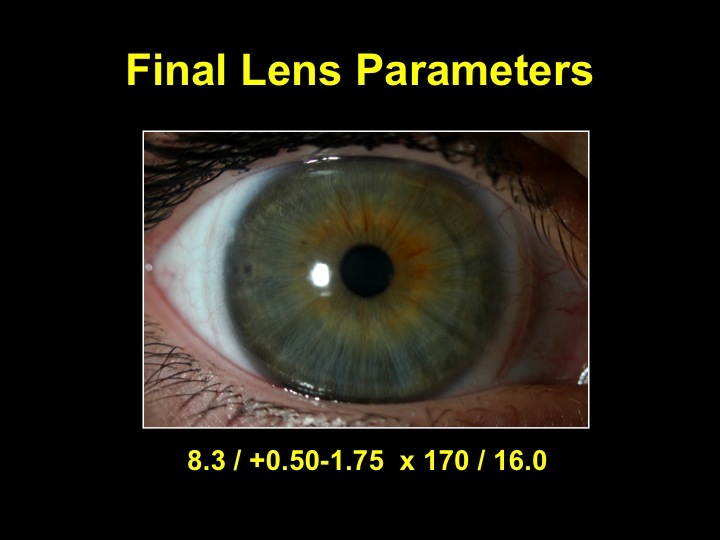 Figure 3 (below) shows the patient wearing the final lens parameters of base curve 8.3mm and lens diameter of 16.0mm.